The initial goal of approximately 2.5 years of training is finally coming to fruition. I am currently in Baikonur, Kazakhstan performing final preparations for my May 15 Soyuz launch to the International Space Station (ISS) where I will be spending 4 months living and working in space. My crew mates are cosmonauts Gennady Padalka, a veteran space flyer dating back to the Mir Space Station and Sergey Revin, a rookie. I am lucky to serve with these gentlemen, not only as colleagues but as friends. When we arrive, we will be greeted by American Astronaut Don Pettit, Dutch Astronaut Andre Kuipers and Russian Cosmonaut Oleg Kononenko (ISS Expedition 31). Once they depart in early July, we will be joined by Astronaut Suni Williams, Japanese Astronaut Aki Hoshide and Russian Cosmonaut Yuri Malenchenko (ISS Expedition 32). Due to the facts that I will be launching on a Russian vehicle and the true international nature of the Space Station, my training has taken me to Russia, Canada, Japan and Germany. All of my US, Canada, Japan and Germany training was completed by the first week of April. On April 8, I arrived in Star City, Russia to complete the final training and examinations on the Russian segments of the ISS and the Soyuz spacecraft. These extensive exams took place over a 2-day period and are an important milestone on our path to launch. We worked well as a crew, passed our exams and showed that we are ready to embark on this journey. After final exams, we were given a few days of crew rest. This is a critical time to not only rest the body, but to get things in order before you leave the planet in order to put your mind at rest. On May 2, we had the traditional farewell breakfast in Star City before we boarded our plane to Baikonur. Why do we arrive in Baikonur 2 weeks before launch? There are many final preparations that need to be done and you want to do them at a pace where the crew can be assured to launch well rested. Our second day in Baikonur was very important and one of my favorites, of course not including launch day. This was our first opportunity to get in our actual vehicle, both in regular flight suits and our Sokol space suits. Just as I experienced with my shuttle flight in 2009, no matter how good a training model is, there is no substitute for being in the real deal. It was also an opportunity to “leak test” our space suits one more time before the day of launch, in which we will do our final leak check. If any off nominal event was to occur, these suits are our first line of defense. In a few days, we will do our final visit to the vehicle once it is fully packed. In the meantime, we have various classes and briefings, we review flight procedures and remain in a quarantine status. Family and friends that are coming out for launch will arrive in a few days. Even though it will be in a very controlled environment, it will be great to see them. From my family, it will be my mom, dad and sister. I feel very privileged to have this opportunity to contribute to our collective exploration of space. While the astronauts and cosmonauts are the most visible members, we are the smallest of a truly monumental team that consists of trainers, flight control teams, engineers, technicians, scientists and doctors, to name a few. The science being conducted aboard the ISS could not be done without the efforts of each person involved. I thank you for all of your hard work and dedication to an international space program. I would also like to thank everyone reading this for your support. I truly believe the work we are doing does and will continue to have concrete benefits. When I was a kid, my grandparents lived in Merritt Island. Being the Asimov loving, Star Trek/Wars worshiping geek I was, I could not get enough of earth sci-fi, earth science or space, and would beg my family to take me to Kennedy Space Center, in hopes of rocket launches or breathing the air that an astronaut did. Despite this, it never occurred to me that I could choose a STEM career path. Fast forward several years and the future is now. Though I have pledged allegiance publicly to my favorite astro-gardener (say hi to Don P for me when you get there, please! ), I feel an affinity for you. We have the same birthday (5/17 and even the year! ), my mom works in the Dunnellon schools as a librarian, and I grew up in Miami and am comfortable with Spanish.. So even though it’s really your glory, even though you did all of the hard work, studying, training, long hours, faraway places, and crazy exercises, I feel like you, in particular, are going for me, too. I will watch all the feeds, look for the tweets, hope for a blog (you’re wonderfully descriptive) and say little prayers for you to have the most amazing journey, incredible experiences and smooth rides. And of course, when the ISS flies over my house, I will wave! A donde el corazon se inclina, el pie camina. …and Happy Birthday & Godspeed! keep posting your experiences if possible during your mission. know that we’re all behind you and are truly grateful for all you do to further the USA and internation activities of the space programs. the world needs more people like you and your colleagues. If possible, post as many pictures of the day to day life activities while on orbit. We really enjoy these. Godspeed to you, Joe, Gennady, and Sergey. Will be watching when you light the candle and head for the ISS! Hi cousin, have a blessing trip, thank to put the name of Puerto Rico in the space, Im very proud of you, God bless you and come back soon as possible to planet earth, wow jaja. I wish you and the cosmonauts of ISS Expedition 31 a successful mission. I’ve always followed your career in NASA and feel very proud that a fellow Puertorican is an Astronaut. You are one of my national heroes along with Pedro Albizu, Roberto Clemente, and many others. God Bless you and we’ll be there to welcome you back to earth when the mission is over. Enjoy your space travel boricua, greetings from your island Puerto Rico…Wepa! Great to read this first post of yours. Wishing you good luck in the coming days. May God Bless you and the crew. I congratulate you on this trip. Have a pleasant trip. Enjoy and share the experience. Blessings. Here greetings from my 8 years old boy Alejandro for you: Eres el mejor y espero estés bien. Que tengas éxito en la misión. Has a very good Journey. I hope so coming soon with a good experience. From Puerto Rico. The Tocaya of your Sister. 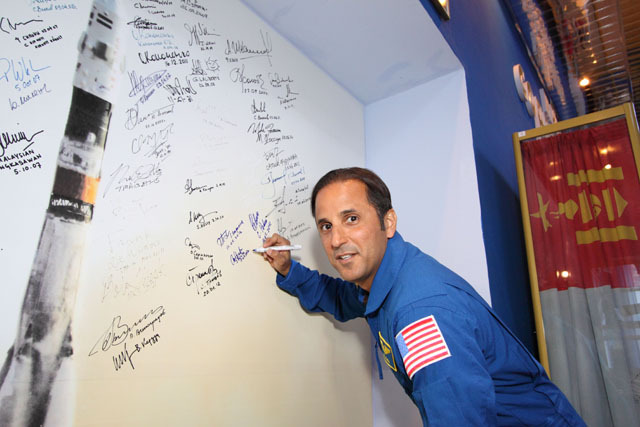 Astronaut Joe Acaba thanks for sharing those experiences and letting us be part of this new assignment . I wish you the best, in this new mission as a flight engineer . I was reading primerahora newspaper in PR, and they gave the link of your blog, i find interesting in writing you from my 12 years old son PS3 from bayamonPR, were there are lots of young people who admire you and see you as a role model. We are very proud of what you have become and your archivements. I am positive this new mission will bring new knowledge and ideas for a better living. Dios le bendiga siempre. Hard work and Sacrifice and been in place to achieve this goal in your career. As part of the Puertorrican community, your accomplishment create great pride to all of us. You completed what other only dreams about. Hola Acaba, Godspeed!!! from Arecibo, Puerto Rico Mi son is a fan of you. Thanks for making memories in space. Hola Mr. Acaba, Godspeed…My son is a fan of you. Thank you for making memories in space. We wish you continued success in all your efforts in this mission and also to your fellow cosmonauts and astronauts. Godspeed, Boricua! I will see to the nasa sts 119- 2009 and Expedition 31/32 Flight is name Joseph M. Acaba. I will hope you see the nasa Tv. Have a good flight Joe! Remember to take some pictures of Dragon when it is finally up there! Joey, I am so proud to call you my cousin. The things you have accomplished in life amaze me. I am so happy for you. I am grateful that my children have you to look up to. Please be careful out there in space. I hope to be able to reconnect with you in the near future. It has been too long since we last talked. Thanks to all those of all nations who take us into the future but benefit us now. We are very proud of all of you. The people in Puerto Rico is very excited about this flight. Keep up with the good work! Congragulations from the town of Guayama,Puerto Rico. And have a safe trip to the ISS tomorrow night. God Bless all of you. great launch, Waited up all night to watch your launch , which was 4.01am G.M.T. watched it live on my 42 inch tv via computer. Wished i was aboard going to the ISS for a duration to see the planet from a lovely prospective. Have a safe Expedition and a safe return home. I will follow Expedition 31 as i do all expeditions. Its a great job you do and i know its hard work also very challenging to. God be with you. All people from America are very proud of you and your work at NASA. I congratulate you and all members of the various space programs that work together to advance the space knowledge of humanity. I hope your work aboard the International Space Station’s success. I wish you a successful stay and a safe and happy return. Sound very exciting. Good luck with your journey.